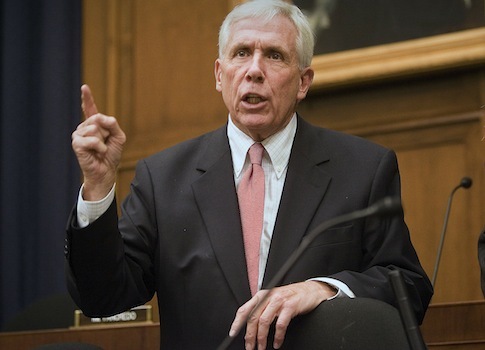 Rep. Frank Wolf (R., Va.) called on Congress to restrict travel and material support to Syria in a statement on Thursday morning. Wolf pointed to the new revelations of an American suicide bomber’s trip to the United States shortly before he committed a suicide attack in Syria. "We should all be concerned about the ease with which Americans are able to travel to Syria and connect with terrorist groups, like ISIS and other al Qaeda affiliates," Wolf said in a statement. Wolf called on Congress to pass a bill that he introduced in March. The bill, H.R. 4223, would give the president temporary authority "to restrict travel and material support to countries like Syria" where terrorist groups are actively engaged in fighting. The bill focuses on keeping American nationals from joining the conflict while allowing travel for journalists, aid workers, and other government-approved groups. "If we fail to act, we will see more radicalized Americans who will pose a threat to the U.S.," Wolf said. "This bill is a commonsense step to confront this problem." This entry was posted in National Security and tagged Al Qaeda, Frank Wolf, Islamic State, Syria. Bookmark the permalink.